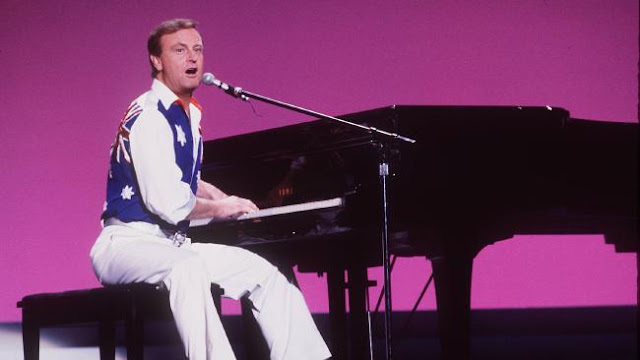 Peter Allen was born Peter Richard Woolnough today, February 10, in 1944. He was an Australian-born singer-songwriter, musician and entertainer, known for his flamboyant stage persona and lavish costumes. His songs were made popular by many recording artists, including Melissa Manchester and Olivia Newton-John, with one, "Arthur's Theme" sung by Christopher Cross, winning an Academy Award for Best Original Song in 1981. In addition to recording many albums, he enjoyed a cabaret and concert career, including appearing at Radio City Music Hall riding a camel. His Australian patriotism song "I Still Call Australia Home", has been used extensively in advertising campaigns, and was added to the National Film and Sound Archive's Sounds of Australia registry in 2013. Allen was the first husband of Liza Minnelli, with the couple divorcing after 7 years of marriage; he later came out as gay. Peter Allen was born in Tenterfield, New South Wales, Australia. He was the grandson of George Woolnough, whom Allen immortalised in his song "Tenterfield Saddler." He began his performing career with Chris Bell as one of the Allen Brothers, who were a popular cabaret and television act in the early 1960s in Australia. He began performing as "Peter Allen" around the same time. Mark Herron, the husband of Judy Garland, discovered Allen while he was performing in Hong Kong. Allen commenced releasing solo recordings in 1971, but throughout his career achieved greater success through his songs being recorded by others. He scored his biggest success with the song "I Honestly Love You", which he co-wrote with Jeff Barry and which became a major hit in 1974 for Olivia Newton-John. Allen also co-wrote "Don't Cry Out Loud" with Carole Bayer Sager, popularized by Melissa Manchester in 1978, and "I'd Rather Leave While I'm in Love", also co-written with Bayer Sager and popularized by Rita Coolidge in 1979. One of his signature songs, "I Go to Rio", co-written with Adrienne Anderson, was popularized in America by the group Pablo Cruise. Becoming more comfortable with his homosexuality from the 1970s to 1984, Allen had a long-time partner, Gregory Connell. Connell was a fashion model from Texas who designed the sound and lighting for Allen's shows and sang backup on his rendition of "I Go to Rio." Connell died from an AIDS-related illness in 1984 at their home in California. Allen's last performance was on January 26, 1992 in Sydney. He died in San Diego, California, on 18 June 18, 1992 from an AIDS-related throat cancer. Allen was one of the first well-known Australians to die from AIDS. Several years after his death, the musical The Boy from Oz was written about his life. It ran on Broadway and earned Hugh Jackman a Tony Award for Best Actor in a Musical.